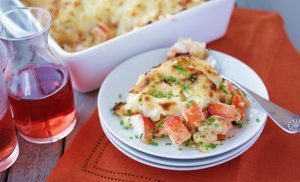 Nearly everyone on Maine’s Little Cranberry Island makes this pie and it has evolved as the island’s residents improvise and add to the basic ingredients of lobster and carrots in a cream sauce, covered with buttery mashed potatoes. After my friend Sonja’s wedding on the island a few years ago (I arrived on a tiny mail boat from Northeast Harbor), we walked up the road to the Islesford Neighborhood House, used for community activities, and this was the main course at the reception, made by many locals. The bride began with a version from Karen Fernald, daughter of lobsterman Warren Fernald, and tweaked it with cream cheese and Parmesan to come up with this. It tasted very good and should have: The lobsters had been caught that morning in the waters just beyond where we ate.